Lt. Col. Jhonson Simatupang of the Indonesian Air Force said Indonesian rescuers have sent a Super Puma helicopter to inspect an area where the Russian team assisting in the search for the AirAsia QZ8501 wreckage has found suspicious objects. 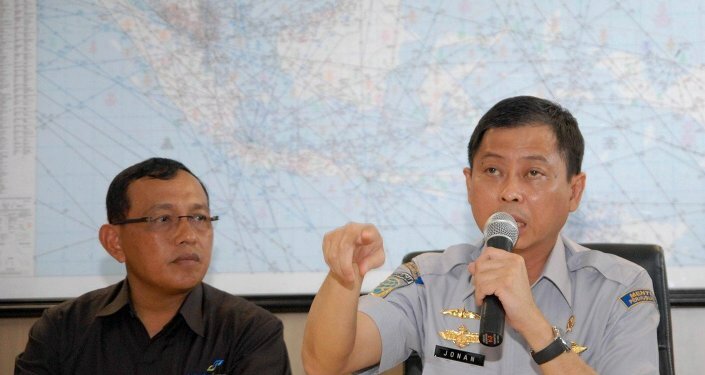 BALI, January 6 (Sputnik) — Indonesian rescuers have sent a Super Puma helicopter to inspect an area where the Russian team assisting in the search for the AirAsia QZ8501 wreckage has found suspicious objects, Lt. Col. Jhonson Simatupang of the Indonesian Air Force said Tuesday. “They dropped a floating buoy from the plane. The flight took place after dark,” Simatupang was cited as saying by the Indonesian Detik news website. On Monday, head of the Russian search team in Indonesia Eduard Chizhikov stated that Russian rescuers had found 30 objects and a body near the suspected crash site while flying over the area on a Be-200 amphibious aircraft. More than 70 Russian rescuers are currently in Indonesia to assist in the search for AirAsia's Airbus A320-200, which crashed into the Java Sea on December 28 carrying 155 passengers and seven crew members.